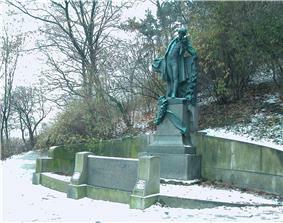 Karel Hynek Mácha (Czech pronunciation: ) (16 November 1810 – 6 November 1836) was a Czech romantic poet. Macha was honored on a 50 Haleru and a 1 Koruna stamp on April 30, 1936, Scott Catalog # 213-214. The stamp depicts a statue of Macha that is found in Prague and was issued by the postal agency of Czechoslovakia ('Ceskoslovensko'). He was again honored on a 43 koruna postage stamp issued by the postal agency of the Czech Republic ('Ceska Posta') on March 10, 2010. This 43 koruna postage stamp is presented on a miniature souvenir sheet. The Scott catalog number for this postage stamp honoring Macha is Scott #3446. 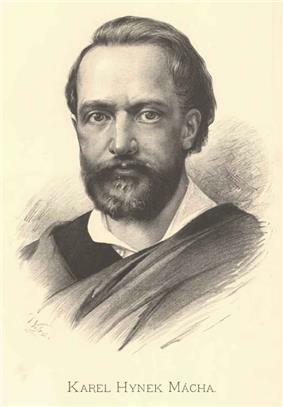 His lyrical epic poem "Máj" (May), published in 1836 shortly before his death, was judged by his contemporaries as confusing, too individualistic, and not in harmony with the national ideas. Czech playwright Josef Kajetán Tyl even wrote a parody of Mácha's style, "Rozervanec" (The Chaotic). "Máj" was rejected by publishers, and was published by a vanity press at Mácha's own expense, not long before his early death. ^ a b c d Marcela Sulak, "Introduction," in Mácha, Karel Hynek; Marcela Sulak (trans.) (2005). May. Prague: Twisted Spoon Press. pp. 7–18.